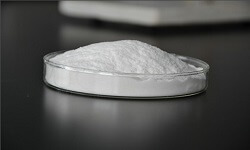 Sodium carboxy methyl cellulose is the sodium salt of carboxy methyl cellulose (CMC), and the carboxy methyl cellulose derivative (-CH2-COOH) is bonded to some of the hydroxy groups of the glucopyranose monomer constituting the cellulose backbone. It is synthesized from the base-catalyzed reaction of cellulose with chloroacetic acid. The polar (organic acid) carboxyl groups make the cellulose soluble and chemically reactive. The functional properties of CMC depend on the degree of substitution of the cellulose structure (i.e., how many hydroxyl groups participate in the substitution reaction), and the chain length of the cellulose backbone structure and the degree of clustering of the Carboxymethyl substituents. Raw materials (refined cotton, caustic soda, alcohol) mixed—alkalify—etherification—washing neutralization—squeezing—washing—rake the dry—-drying—crushing—package. The main chemical reactions of sodium carboxymethyl cellulose are alkalization reaction of cellulose with alkali to generate alkali cellulose and etherification reaction of alkali cellulose with monochloro acetic acid. Following the initial reaction, the resultant mixture produces about 60% CMC plus 40% salts (sodium chloride and sodium glycolate). This product is the so-called technical CMC which is used as a surfactant in detergents. A further purification process is used to remove these salts to produce the pure CMC used for food, pharmaceutical, and dentifrice (toothpaste) applications. CMC is also used as a thickener for pharmaceuticals and as a component of drilling mud in the oil drilling industry as a viscosity regulator and water retention agent. In the food industry, sodium carboxymethyl cellulose is used as a filler.